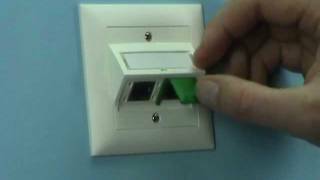 Color coding for RJ45 patch cords and consolidation point patch cords. Color coding to be snapped onto the patch cords' strain relief sleeve. Including a field for logos and labels. Simple visual color coding of specific network services. Exchangeable and re-usable color coding.